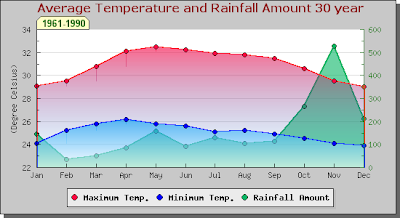 The Weather statistics Koh Samui, Thailand features a tropical monsoon climate under Köppen’s climate classification. However the island only has one true dry season month. Average monthly precipitation in February falls below 60 mm, the threshold for a tropical dry season month. Koh Samui, located in Surat Thani Province, is warm and moist for most of the year. However, in comparison to Phuket and most of the rest of Southern Thailand, Samui's weather is relatively dry. The heaviest precipitation is typically seen in the months of October and November. For the rest of the year, since the weather is tropical, when it does rain, it usually doesn’t last long; rain showers of 20–60 minutes are typical. The island sees on average just under 2000 mm of precipitation annually. In general not much rain, but some refreshing wind or breeze at this time is not unlikely. Great for wind and body surfing. This season normally sees a lot of sunshine. The weather is still dry in this time, and it is usually very sunny and hot. In May it might rain a little more though. This is a great period to visit the islands although temperatures ranging from 28-35 degrees Celsius can easily be reached during daytime. Also known as the monsoon season. It's still hot and normally there are many sunny days in the monsoon period. On some days you might find yourself in a refreshing monsoon shower for a moment. The rain showers are often short and as these island's water supplies are finite, the rain is needed and important. November can get very wet though. Please have a look at my archives, half way down the page, right hand side, they go back a few years. Open a month that you’re interested in and check one of the last posts of each month, starting with ‘Goodbye to…………’ this post will tell you the weather conditions for that month. You can also check each individual post for that month if you wish to. My family and I are planning to visit Thailand on August, but we didn't expect a hot season. Well, that won't stop us from touring. Do you know where we can find the best hotels that have ducted air conditioning system? It feels colder than a single-unit air condition. Yes, August is usually very nice on Samui! I must admit that I never heard of these kind of a/c units but I would assume that new hotels will more likely an a/c unit like that. Hi Camille, My family and I are planning to arrive on Samui in the beginning of June ( 4th ) what are the seas like? I hear if you want to snorkel then June is the best time. We are hoping for clear skies too but accept we will get the odd shower some days. June is usually a good month, please have a look at my archives, half way down the page on my Samui info and weather blog, right hand side, they go back a few years. Open a month that you’re interested in and check one of the last posts of each month, starting with ‘Goodbye to…………’ this post will tell you the weather conditions for that month. You can also check each individual post for that month if you wish to. my partner and I are planning to get married in Koh Samui on the 15th of November this year. We know it's likely to be wet, but is it usually wetter in the morning or afternoon? We're trying to decide what time to have the ceremony to get the best chance of dry weather. In my opinion November is not a good choice to get wed on Samui, it well may rain all day long. Please have a look at my archives, half way down the page on my Samui info and weather blog, right hand side, they go back a few years. Open a month that you’re interested in and check one of the last posts of each month, starting with ‘Goodbye to…………’ this post will tell you the weather conditions for that month. Maybe the Andaman coast will be a better option in November. Hi Camille! We have been at Samui for a week now and it has been a lot of clouds and rain. Some people urge that climate is changing over the last years and getting more hunid in summer. What is your impression? Please answer til arild.haugen@telenor.com. We've seen some unusual weather patterns 'out of season', so there may well be a world wide change in climate. Typically the end of August and early September should be really nice! Hi Camille. Your blog is fantastic, I've found out loads so thank you my partner and I arrive in Samui on the 31st of Aug for 9 nights. What do you think the weather will be like? We would love to do a boat tour or visit another island, what do you guest? Have a look at the post above, I can give the same advice, late August and early Deptember should be fine but Please have a look at my archives, half way down the page on my Samui info and weather blog, right hand side, they go back a few years. Open a month that you’re interested in and check one of the last posts of each month, starting with ‘Goodbye to…………’ this post will tell you the weather conditions for that month. Thank you so much for your informative blog. It is very useful! Thank you for your hard work. I booked my trip to Koh Samui on 9-12 November this year, without checking the weather. It seems like it is a bad time to visit the island with the monsoon and possibly flooding in the island. May i check with you, which part of island should i avoid to book my accommodation so as not to caught in the flood? Is Lamai/Chaweng beach prone to flood? Thank you! Looking forward to hear from you. Unfortunately November is indeed not the best month to visit Koh Samui. You can get lucky but in general you can expect a bit of rain. All parts are prone to flash flooding, both Chaweng and Lamai are no exception, but both parts of the island have areas that flood less or not at all. Thank you so much for your reply. Could you please kindly share more about areas that flood less or not at all? Most of the island will be affected by floods if we have torrential rain for longer periods of time. As already mentioned though, most flooded areas tend to be back to normal within hours after it stops raining. Areas that flood badly are in Chaweng near Centara Beach hotel and in Lamai on the main road, near the first entrance to Lamai, coming from Chaweng. Chaweng Noi (South Chaweng) is an area that is not affected too much, especially the hotels located at the ring road there, like New Star. These are however high end of the range hotels. Two weeks from now will put you at the end of October/beginning of November. It's hard to say when the rainy season starts, there's no fixed date or time. It literally can happen any moment. Typically you should be just about fine but don't be surprised if the rain has arrived by than. I am scheduled to visit KS Nov 20th and stay 3 weeks. Will I have missed the majority of the rain or will I be smack in the middle of down pours? I am considering staying on the mainland for a while and arriving in KS early december instead..What do you think? It looks like you might end up in the middle of the rain, usually end of November and early December are the worst part of the rainy season. My wife and I are going to Koh Samui on our honeymoon from the 3. of december to the 18. of december. Unfortunately we were foolish enough only to check the weather in Phuket, unaware that there is a big difference between weather conditions compared to Koh Samui. Now we are affraid that our trip is going to be ruined by rain and storms. Could you please tell us if we are wrong or not to worry and if there are parts of the island were its better to stay in terms of weather and water conditions. In short: what would you recommend? Statistically the period that you're visiting Samui is not a very good period, it typically in the middle and usually the height of the rainy season. If it's raining, most to all of the island is affected but the places with most flooding are certain parts of Chaweng and Lamai. In general, have a read through my answers on the various comments on this page and I hope you will be lucky enough and still enjoy your stay on Samui. Thank you for your speedy reply:-). We will be staying at New Star Beach Resort in Chaweng the first three nights but after hearing about the weather conditions we are considering leaving Koh Samui after that and visit other parts of Thailand. Do you know what the weather is like in for example Krabi or Phuket right now? Or could you recommend a place were the weather is nice and the beaches are beautiful this time of year? The New Star is great choice :-) so that's a good start. Statistically speaking Krabi and/or Phuket should have good conditions but my recommendation is to play it by ear. If Samui is really no good, book somewhere else where there is sun but if the forecast for Samui looks good, stay! is that a good place and do you think I would have missed the rain? Chaweng Buri is fine, it's in the middle of Chaweng and by the 25th the weather should be fine. You still may have rain but ideally not for days in a row anymore! My mother and I are planing a holday to Samui in Dec this year and I want to know what the weather (rain) was like this last December? We have come a few times and have had great weather but our last trip in 2011 it rained all day most days which is unseasonal for December isnt it? Basically, we are trying to work out weather the rain is normally in short bursts or whole days in December? Last year December was rather dry but it is at the back end of the rainy season so you may get a lot of rain December. To get a better understanding of all the recorded December months on my blog, please have a look at my archives, half way down the page on my Samui info and weather blog, right hand side, they go back a few years. Open a month that you’re interested in and check one of the last posts of each month, starting with ‘Goodbye to…………’ this post will tell you the weather conditions for that month. Me & my fiance planning our honeymoon from 8th Sep to 12th Sep in koh samui. And 12th to 14th Bangkok. Can u tell me is it best time to visit. And what all place i can explore in koh samui. Usually September is a very good month to visit Koh Samui. The nice dry and warm weather conditions of August typically carry over to September. To get a better understanding of the weather conditions during September, please have a look at my archives, half way down the page on my Samui info and weather blog, right hand side, they go back a few years. Open a month that you’re interested in and check one of the last posts of each month, starting with ‘Goodbye to…………’ this post will tell you the weather conditions for that month. There are plenty of things to see around Samui, please visit the label Tourist attraction and you find some ideas. With Bangkok in September I have less experience but it seems to be the wettest month of the year, with an average of 22 days of rain out of 30. It's hot though and plenty of indoor things to be done and researched. June is usually very nice. Warm to hot and mostly dry with an occasional shower. For more in-depth information please have a look at my archives, half way down the page on my Samui info and weather blog, right hand side, they go back a few years. Open a month that you’re interested in and check one of the last posts of each month, starting with ‘Goodbye to…………’ this post will tell you the weather conditions for that month. Your blog is just brilliant, thanks for keeping this up to date! We are looking at a trip from the 27th Aug to the 9th Sep with 4 nights on; Koh Samui, Koh Tao and Koh Phangan. The internet has very mixed views on the weather at that time of the year with some saying its rainy season from Sept. What should we expect? i would be very dissapointed if it rained everday and was cloudy! whats your advice? Late August and early September is usually a very good period to visit Samui with plenty of sunshine. For a more detailed and in-depth information, please have a look at my archives, half way down the page on my Samui info and weather blog, right hand side, they go back a few years. Open a month that you’re interested in and check one of the last posts of each month, starting with ‘Goodbye to…………’ this post will tell you the weather conditions for that month. We are thinking to come next week, as of Sunday 15/6 or Monday 16/6, but gave not decided yet. Do you think the bad weather will persist? Do you have an idea what it is projected to be like the next days? Currently Monday the 16th still looks like it may have some rain but as of the 17th there should be no rain anymore. However, you may expect cloudy skies and strong wind and don't be surprised if it does rain occasionally. Not ideal but can still be enjoyable unless you're looking for a beach break. Do you think there might also be no possibility of diving during this period? It's tricky, today all boat traffic was cancelled for dive trips, however, the ocean turned out to be fairly calm. Until around 6pm when a real mini storm swept over. We had a few showers and that was about. According to the forecast, this kind of weather can be expected for the next couple of days. Tomorrow the boats are going out again. Hard to predict at this stage, we all hope it remains good enough to dove! Other parts of Thailand have more problems due to the current weather than we had so far on Samui. Love your posts!! Best Samui resource ever! I just read on your blog it was/is a bit stormy... How was the weather for the rest of today? Still so grey? And not possible to dive? We were thinking to come as of tomorrow for a week to relax on the beach and also do some diving, but haven't booked yet, so playing it by ear a bit. Hope divers were able to go out today! Today saw nothing of the announced storm, it was cloudy all day long but it was dry and the sun tried to peak out but was outflanked by the clouds. The divers did go out today. See above, it was grey all day but dry and sometimes there was a strong breeze, but all not as bad as I expected. Tomorrow should be fairly nice but next week should see strong wind and some rain again. It could change for the better......you never know. I'm arriving in koh samui on the 4th October for 10 days, what do you think my chances of sunshine is? I read your average temperatures and noticed October last year had 20 days of rain can this consist of minutes of rain or is this full days? usually that early in October, if you have rain, it will be sporadic and in a tropical variation, meaning, hard rain for maybe an hour but before and/or after you could have sunshine. However, if the rainy season starts early, you could have rain for hours on an end. The latter option is not impossible but rather unlikely during early October. Thank you for your reply, just to pick your brain once more, am I right in thinking that Koh Samui would be the better option at this time of year ( early October ) in terms of weather. If you're comparing to the West coast (Phuket etc), it's a bit of a toss up. They can both be good or bad, since Samui (the Gulf of Thailand) is coming out of and going towards the rainy season and Phuket (Andaman Sea) is going into their good season. Very difficult to predict that one! In general early September has the luck of the gentle August weather being carried over. The website I use for predicting weather on Samui don't check further than just seven days ahead. A bit early now to make any statement I'm afraid. Thanks for keeping such an informative blog! My husband and I are visiting Koh Samui from August 26th- 29th. We are a bit worried about the weather- as it appears the good stretch of weather will end just before we arrive. Any chance our predictions don't match your weather sources? We're planning to visit Koh Samui from 27th to 30th October. Wanted to knwo what will the weather be like. Will there be rains the entire day or just short showers? Have seen past records but every year has been different! That's why its confusing as to how the weather is during the last week of October. Towards the end of October the weather can go either way but it's very near to the start of the rainy season, which usually is in November. Hard to predict this one, especially so far ahead of time. In my experience, the rainy season tends to stop around mid December, regardless of how wet it was. It doesn't tend to move towards the end of December. In general after mid December the weather steadily improves and around Christmas and New Years Eve we usually have relative nice weather. Yes, there can be a shower but typically not all day long. This is no guarantee but it is my observation over the 15 years that I live on Samui. I understand we can never predict what the weather will do but I am planning to visit koh samui on the 7th of June for 2 weeks - generally is this a good time to visit? I would love to have some sunshine whilst there? Hi Sophie, that's indeed far ahead of us. I have booked 2 weeks on koh samui/phangan from 1st September this year. Are we likely to get much rain during this period or can we expect generally dry sunny weather? I have done a lot of reading around this on blogs, forums Etc and the overall consensus is a positive one but having read back through last years September archives it seems last year wasn't as great?! I holidayed on samui last year between June and July and had lovely weather with a clockwork thunderstorm around 6-7 every evening although this did not bother us. Can we expect similar trends in rainfall in September? I know we can't predict but in your opinion and experience should we expect good weather during this period as the many blogs, reviews, websites suggest? Also, can you take a direct ferry from samui to koh tao and back rather than a guided koh tao snorkelling tour?! Thanks for the heads up. Usually September is nice, the nice August weather should be enjoyed also throughout September. There are exceptions of course. In general, my experience is good though for September. There most certainly are direct ferries between Samui and Koh Tao, the Seatran in Bang Rak and the Lomprayah in Maenam offer these services. You can leave early in the morning and make it back to Samui the same day. I though feb was dry season! Wedding is 5 till late. Do you think its going to rain all day? It's a bit early for me to comment on this. If I could predict this, I would be a very rich man! Give it a few more days before you can get a better idea. Currently there is almost every second day some afternoon rain, that doesn't mean there will be rain come the 18th. February as such is not a dry month on Samui, it's a fairly dry month though in general. You're welcome and I hope the information was useful. One more thing, is there a 14 day forcast site you reccommend? They all seem to say different rather things! All links for meteorological sites I have, can be found on this page. Hello camille. I will be in samui 10 to 18 October. How will the weather, according to you? Thanks for dropping by and checking out my Samui info blog. October can be tricky but is in general still a nice month, although in the worst case scenario, the monsoon can start. Please have a look at my archives, halfway down the page on my Samui info and weather blog, right hand side, they go back a few years. Open a month that you’re interested in and check one of the last posts of each month, starting with ‘Goodbye to…………’ this post will tell you the weather conditions for that month. Dear Camille,me and my wife are planning to travel to samui end of may 2015, around 23-30th. The weather forecast shows rain and clouds everyday with thunderstorms. How badly will that effect daytime activities like watersports and bungee jumping and driving around on a scooty, clubbing at night. We don't want to be stuck insides. What will you advise, or maybe we should also look elsewhere for drier alternatives. We come from a pretty dry climate so we don't mind a bit of rain. Cheers. It's a bit far ahead to give an accurate prediction for that period. However, usually, this time of the year, showers don't last very long and you should be able to enjoy most activities you mentioned. Hi, im travelling to koh samui tomorrow evening and looked at the forecast it says everyday its rain and thunderstorms, is this right? I really hope we still get a tan and can explore the islands still? The forecast is showing mostly cloudy days over the next ten days with hard wind coming in Friday evening accompanied with some rain but after that we're back to occasional scattered tropical showers. You still may get sunshine, it's typical may weather though, some sun, some clouds and some tropical showers. You should be able to get a tan and explore, in my opinion and expereince. it will be mine and my boyfriend's first time in Thailand! the weather... do you think we should change our trip to Puket? End of September should be fine, the nice August weather is usually carried over to September. My advise is to have a look at my archives, halfway down the page on my Samui info and weather blog, right hand side, they go back a few years. Open a month that you’re interested in and check one of the last posts of each month, starting with ‘Goodbye to…………’ this post will tell you the weather conditions for that month. This might give you an idea of what to expect during that time of the year. Thank you for a very informative blog. It's quite difficult to trust the weather reports from around the globe, as they allways seems to predict rain or thunderstorms, which doesn't seen to be true. I visited Koh Samui in July 2010 and now I am coming back this July. What is your impression - I've read that the July weather on Koh Samui has changed during the last couple of years (from sunny and hot to cloudy, warm and rainy) - is that your impression too? Thanks for your message! I agree, it is very difficult to trust weather reports! The reason that they always seem to predict rain is in my opinion because they work in percentages of rain vs sun and with a certain percentage of rain possible, it all looks doom to the weather reports. It's nearly impossible for me to predict anything in July, especially at this stage, the only thing I can advise is to look at my archives and check out the July months of the last 7 or 8 years that I covered. This will give you an idea and you can work out the averages. July is a mixed bag though and from sunny days to rain and even storms can come and visit the island, with the weather in general improving towards August. Hi, My husband and I have the option of coming to Koh Samui from Bangkok from 14 - 17 October. I know from reading your page that this is a rainy period. Is there somewhere else in Thailand that would be a better option at this time of year for a resort style holiday? October can be a toss up on Koh Samui, it's either at the end of the 'sunny' season and can still be nice or at the start of the rainy season and can be wet. It's also a transition period for both coasts of Thailand, the Andaman Sea, where Phuket is located, can be a toss up as well, having the reverse profile of Samui, they may be getting out of rainy but not entirely yet into the sunny season. Difficult to predict, my advise is that if you're based in Bangkok, wait for the last moment and decide where you want to go, whilst keeping an eye out on the weather predictions in that period. Good morning from Italy, Camille! Nice to hear from you. October can be indeed good, but the closer you get to November, the more chance you may have for rain. Koh Samui is going into the rainy season or monsoon and the Andaman side is coming out of it, both can be good and both sides can be not so good, very hard to tell. My advice is to have a look at my archives, halfway down the page on my Samui info and weather blog, right hand side, they go back a few years. Open a month that you’re interested in and check one of the last posts of each month, starting with ‘Goodbye to…………’ this post will tell you the weather conditions for that month. Hopefully this will give you better insight on what to expect, but by no means will it be a guarantee. Thank you for your reply, Camille. I know that it is impossible to predict weather and end October typically means change of season in your area...but if it were your choice, would you change destination/period for your honeymoon or would you go there anyway? You can have good weather at either Samui or the Andaman Sea side during this time frame, but both areas can have rain as well. Very hard to predict. 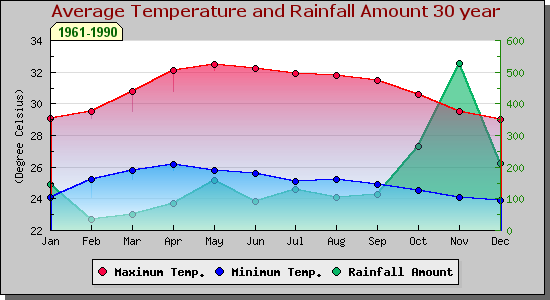 If I remember correctly, last year the Andaman side had rain into early November. Hi camille what doy think the weathear will be for next week? For next week I do expect sunny and nice weather around Koh Samui. I am arrving on 18 to 28 on koh samui,i have seen the forecast the look bad,did you think the are wrong cammile??? Its normal to rain for 7 days in this time of the year. No idea what forecast you are looking at, but the one that I use, shows rain from the 20th, nothing after that is shown at the moment, that's as far as the forecasts that I use go. Weather is fairly unstable and difficult to predict, I am not in a position to give you any advice until we are nearer to your arrival date. If I could predict weather any better, I would be a very rich man. Absolutely love your blog, have found out some great info ! We are due to land in koh samui next Monday , it looks like we may land into a thunder storm & the weather forecast shows rain symbols every day after!!! Are we going to be really unlucky & have a whole week of rain, it do these rain & thunder storms clear quickly!!?? This coming Sunday and Monday may have some rain but after that it looks rather nice and sunny again. Today's weather update on my blog has a link to the website that I use, Windguru, have a look. The link is near the bottom of the post, under the second picture. Thanks for your message. Early to mid December does indeed tend to be monsoon weather. Around mid December the weather tends to get better again and the heavy rains should have stopped by then. My advise is to please have a look at my archives, half way down the page on my Samui info and weather blog, right hand side, they go back a few years. Open a month that you’re interested in and check one of the last posts of each month, starting with ‘Goodbye to…………’ this post will tell you the weather conditions for that month. My sister and I are leaving for Koh Samui tomorrow for 2 weeks. Weather looks horrible and I have only just found out about the weather in May. I knew the wet season was in November/December but I didn't know Samui had a mini monsoon in May. Do you think we will have any sun? This May had some unusual good weather for May. Unfortuantely, the last ten days of the month it looks like it will be unusual wet. There is a bit of a mini rain season in May and June but it seems all to be a bit of upside down this year. At this moment, unfortunately it doesn't look too good for sunshine for the next 7 days, hopefully it will improve after those days. Hi I am visiting Thailand for 3 weeks in November we do plan to visit Koh Samui and Koh Phangan for a few days during the 3 weeks. Is it likely to rain all day most days in November or are the showers just for a an hour or so and then stop? Is it worth visiting Samui and Phangan at all in November??? November is not a very good month to visit the Gulf islands. That's out monsoon period and it can rain for days on an end. It will be a bit risky to visit during that period. You may be better off visiting the the Andaman coast. Check this out; please have a look at my archives, half way down the page on my Samui info and weather blog, right hand side, they go back a few years. Open a month that you’re interested in and check one of the last posts of each month, starting with ‘Goodbye to…………’ this post will tell you the weather conditions for that month. I will be in Koh Samui from the 10th July for two weeks. Looking at the weather forecast it will be very wet. However i also hear that that forecasts always show thunder but in fact the days can be quite sunny and dry, What is the weather actually like to be, will be have dry periods at least? July is typicall a mixed bag, have a look at my forecast of July 2016 on my blog by clicking on the link. You should also have sunny days in July and as ou already mentioned, 'thunder' days may mean only a short shower if at all. My advice is to please have a look at my archives, half way down the page on my Samui info and weather blog, right hand side, they go back a few years. Open a month that you’re interested in and check one of the last posts of each month, starting with ‘Goodbye to…………’ this post will tell you the weather conditions for that month. Hi there Camille, great website which I've been following for some time now. I know that you're extremely busy and sorry if I'm asking a question that has been repeated. I am thinking of visiting Koh Samui next August 2017 with my family. I have visited many times, but not during this month. Am I right in thinking that the rain usually falls in the evening and in short heavy bursts? Thanks for visiting the blog. Yes, you are correct in your assumption, rain during August is typically during the afternoon/evenings and tends to be short but can be heavy. Appreciate your efforts towards this website. Great! 1) During thunderstorms how is the weather in Koh Samui? Does it permit going outside and visiting places/ beaches etc. 2) Do ferry services run regularly during Thunderstorms (from Surat Thani to koh Samui) or would we be stranded in Surat Thani? At this moment I don't have an accurate forecast for around 25th September, but the previous days look really nice at the moment. You will need to wait a few more days before accurate predictions are available. The thunderstorms that are predicted are most of the times given with a % number, that % number is the actual potential of a thunderstorm during that day, and that % can be as low as 20% but it will still be shown with a thunderstorm icon. Strange one that is. Before the ferries between Koh Samui and the mainland are affected, we need a bit more than just a local thunderstorm. don't worry too much about that happening in September, very unlikely. A few of us are travelling to Koh Samui for a few days this November and plan to go to the full moon party on Koh Phangen on the 14th. Will the ferries run between the 2 islands dye to being in the rainy season and is the full moon party likely to go ahead if there is rain? It's very rare that the speedboats or ferries for the Full Moon Party don't run, the weather would have to be really bad before the boats are cancelled and so far I don't know of a Full Moon Party that has been cancelled. It doesn't look like you have to worry. Thanks Camille that's very useful. If it does rain, does it rain the whole day or just during the morning or the afternoon? And also are the tourist numbers really low in Koh Samui and Koh Phangen during November. One of the reasons I'm asking that is I wanted an indication of what the nightlife is likely be like in both Koh Samui (Chaweng) and Koh Phangen (haad rin) and if it's still lively in November? November is low season, so it's not going to be as lively as during other times of the year, although will still be out and about. Regarding the rain, it's monsoon time, in the worst case scenario, you may have a couple of days f non stop rain, hard to say so far in advance. To get an idea what it may be like, please have a look at my archives, half way down the page on my Samui info and weather blog, right hand side, they go back a few years. Open a month that you’re interested in and check one of the last posts of each month, starting with ‘Goodbye to…………’ this post will tell you the weather conditions for that month. Hi there! I am thinking of going to Koh Samui on 17th July for 2 weeks, I don't mind a little rain, but love the sun and would be very disappointed in bad weather. In your opinion what do you think it'll be like? Thanks! In general July should be fine, please have a look at my archives, half way down the page on my Samui info and weather blog, right hand side, they go back a few years. Open a month that you’re interested in and check one of the last posts of each month, starting with ‘Goodbye to…………’ this post will tell you the weather conditions for that month. Hello, we are coming to koh samui on Sunday and I want to know about the weather. The predictions shows thunderstorms. How bad is the weather? Is it raining all day long or just a few hours per day? Does it usually rain all day during this period? Difficult to say, this time of the year it can rain non stop all day long, for a few days in a row. At the moment it's not raining all day but during monsoon season, that is quite possible for rain all day long. To get an idea about previous December months on Koh Samui, please have a look at my archives, half way down the page on my Samui info and weather blog, right hand side, they go back a few years. Open a month that you’re interested in and check one of the last posts of each month, starting with ‘Goodbye to…………’ this post will tell you the weather conditions for that month. Come Saturday the floods should have gone but there still may be rain, although not as much as during the last couple of days.Once it stops raining, most to all floods will disappear within a few days at most. Should be no problem at all, the rain has stopped and shouldn't start again, at least not the way it did during recent days. Most to all floods have receded just within a few hours after the rain stopped. you created a very good weather blog - i like it. I booked my flight to Koh Samui for 18th Dezember (back on 3rd January). After then i read a few weather statistics for december and now i'm a Bit afraid of the Rain. December is usually not that great of a month to visit Koh Samui, it's in the middle of the rainy season and blue skies may be rare. Around Christmas and around New Year you might have a few better days. Right now, please have a look at my archives, half way down the page on my Samui info and weather blog, right hand side, they go back a few years. Open a month that you’re interested in and check one of the last posts of each month, starting with ‘Goodbye to…………’ this post will tell you the weather conditions for that month. My family and I are looking to go to Koh Samui from about 16th September for 2 weeks, but have read many articles about heavy rainfall. Is it likely that you would still be able to enjoy the beach etc (not forgetting getting a nice tan) ? Or is the rain too often and heavy ? September in general should be nice with plenty of sunshine. What rain storms? Statistically it should be fine but the closer you get to November the more likely you may have monsoon or rain season like weather. There should be sun but it's no guarantee, please have a look at my archives, half way down the page on my Samui info and weather blog, right hand side, they go back a few years. Open a month that you’re interested in and check one of the last posts of each month, starting with ‘Goodbye to…………’ this post will tell you the weather conditions for that month.